Many of you probably know @isaackeyet from his contributions to translate.wordpress.org as well as work on the WordPress mobile apps. Well, he’s back again to contribute some new designs to the GlotPress plugin. As part of the design process, Isaac wants to hear from translators and validators alike. 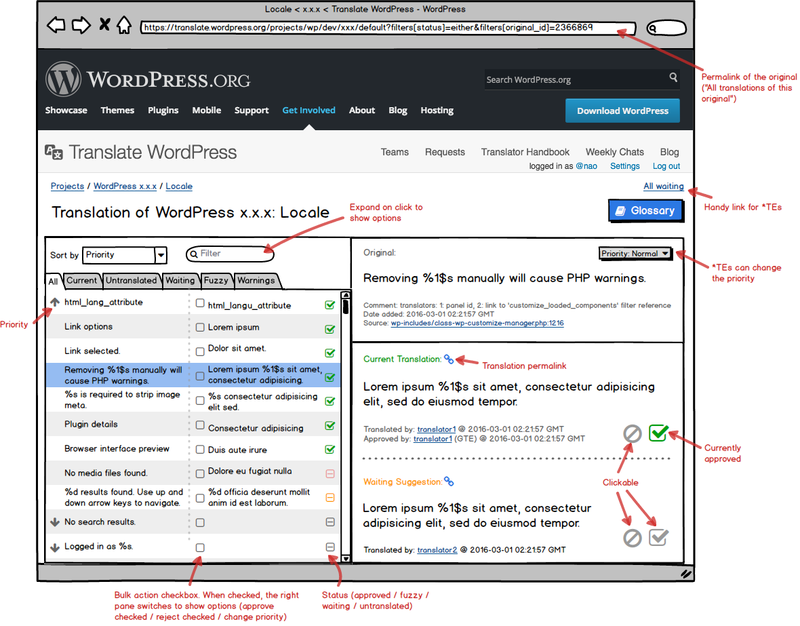 What makes a translation interface good? Every person that reads this post (you!) can participate. You don’t have to be a designer! Use whatever medium you’d like (paper, pen, computer). 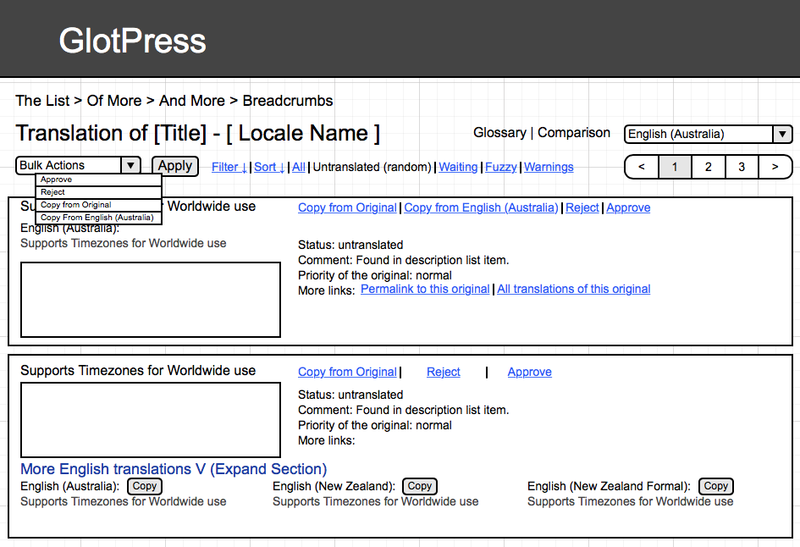 Sketch out your ideal translation interface. Try not to think about specific features. You don’t need to be an artist. Rough sketches are helpful too! Post your picture as a comment here. That’s it! Lots of contributions mean lots of inspiration as Isaac designs the future of GlotPress. Here’s my mockup. Sorry that it’s a bit more complicated than what you asked, but the tool has a lot of features as is. One thing I forgot is a button to suggest new translation (or edit current one), so that has to be added. 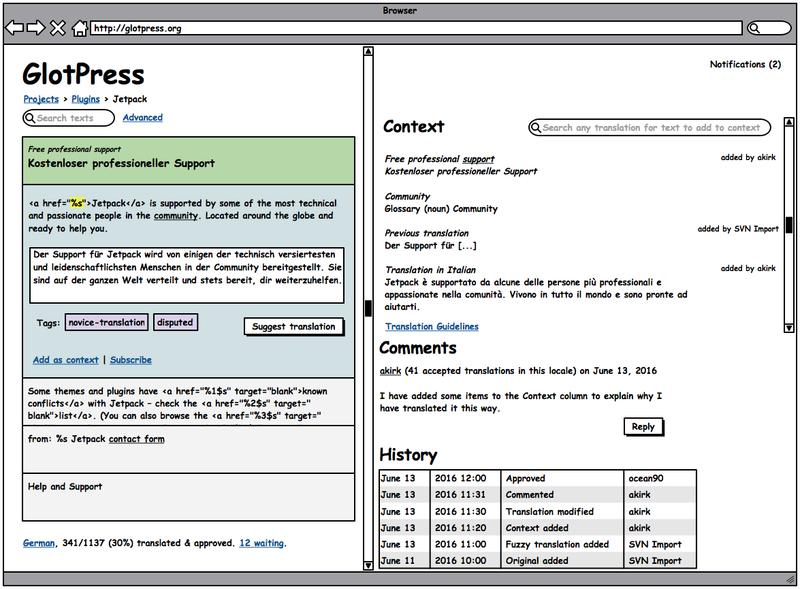 I like the layout and features of Transifex. We don’t need to mimic everything there, but their side-by-side layout works very well for both understanding the overview + working on each string. 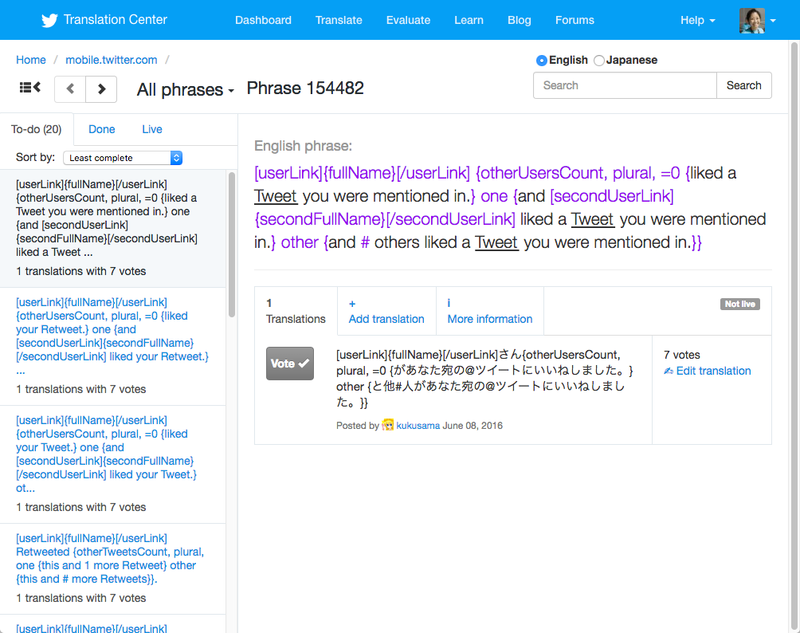 The layout seems to be popular among some other crowd translation tools. 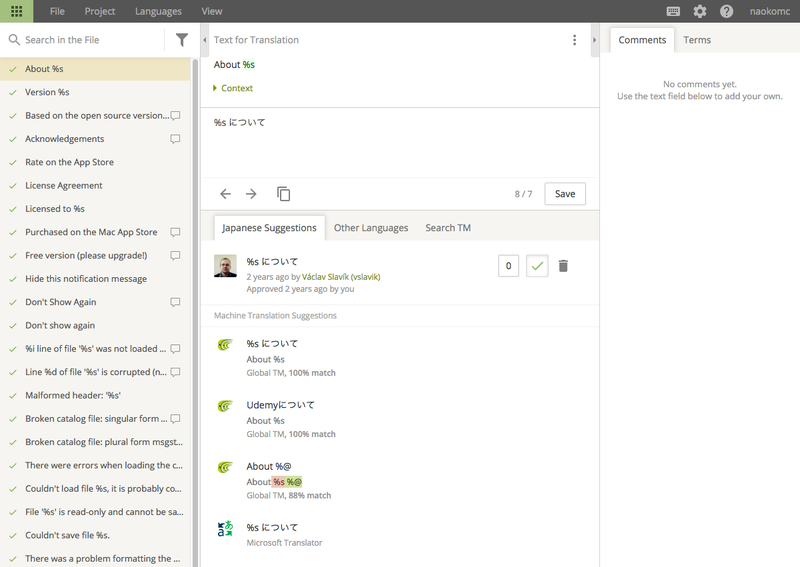 Since we need many screens beside the translation panel, it’s worth visiting these other tools – click the link next to the heading to see a sample project. We’ll be doing an initial Research & Analysis phase with local in person interviews and an inquiry for the remote community. During the next week we will have it ready so we can bring the results to WCEU contributors day where we could work together on a solution. Naoko, are you going to WCEU? Thanks Naoko, we’re currently discussing this approach and will look at other platforms more thoroughly as well. I’d shrink the two-column translation table into a single column table that adapts to the translation status but will expand the same way it does currently. Translations can also be tagged, also both automatically and manually (by moderators). Examples for auto-tags are: translation-memory (1:1 match from another translation), auto-approved (e.g. through a translation memory match), novice-translation (first time contribution), one-word, two-words (for filtering out short translations). These tags can then be used to filter results (e.g. see all contributions by newbies). A notification system allows to subscribe to translations, you’ll be automatically notified about translations you authored. Amazing, very detailed. Thank you Kirk. Join us for a round-table at WCEU! Hey guys 🙂 is there a set time already for the round-table in Vienna? Hello all, haven’t gotten around to do my prototype yet, but before I forget (age is a terrible thing) I wanted to post this as a reminder: when revising translations, at the moment there is no way to easily contact the translator of a specific string to notify him/her of whatever. Without exposing personal details (email etc.) the possibility of a “Contact Translator” function would be very useful for PTEs and GTEs to communicate with Translators. I like what is been suggested I would like to have an integrated way so that Multiple locals of the same language could help each other out. Every Thursday at 17:00 UTC we have our weekly meeting in the #glotpress channel on Slack. 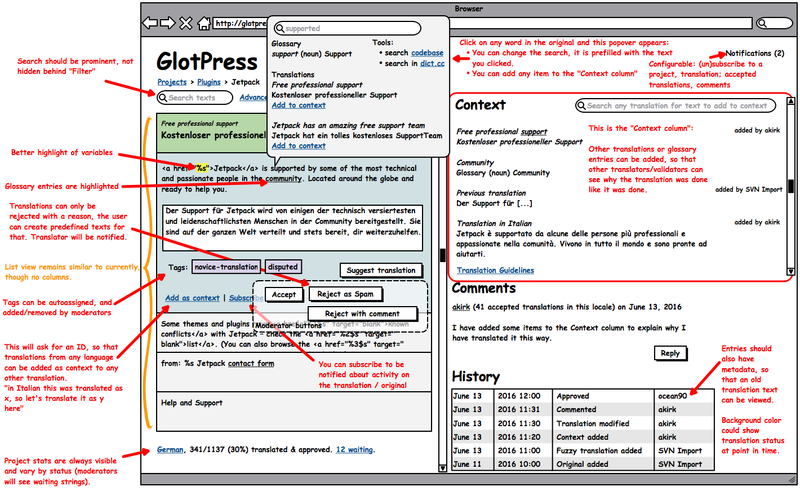 GlotPress is a collaborative, web-based software translation tool. This blog contains development updates and longer descriptions of some of the GlotPress features. You can learn more about the project and the development at the GlotPress GitHub Page. Remove xdebug from 7.3 on travisci.